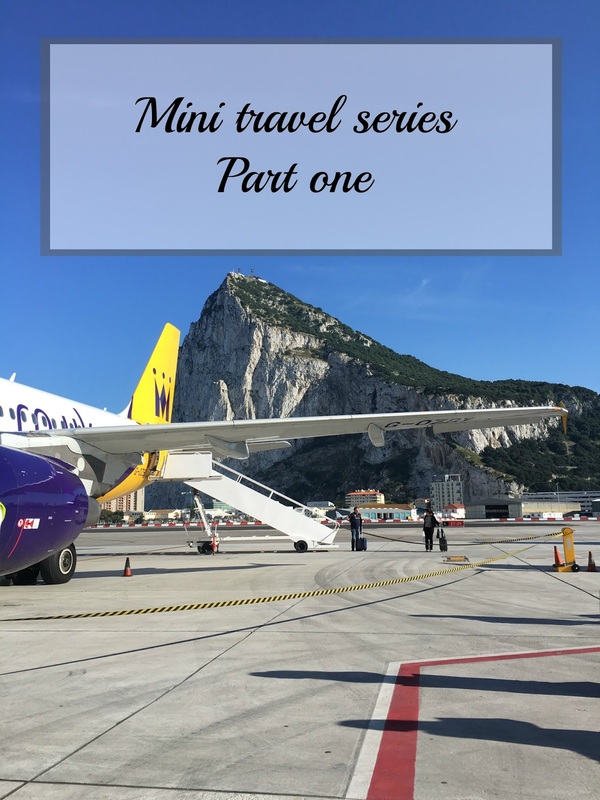 I thought I'd kick off this mini travel series with a post about Gibraltar. This mini series will be based around the Costa Del Sol area of Spain. By 'mini' series I don't mean this post is short, because it's not, it's another photo heavy one but hopefully informative too. Nick and I have visited many times and love it here. We flew into Gibraltar for our last holiday to Spain you can read that post here. It was our first time flying into Gib. We've always gone in from Spain, over the border that way, we were praying it would be a clear day so we could see the rock as we flew in. Luck was on our side, not only was it clear, the sun shone for our arrival. Now, landing at Gibraltar airport is consistently listed as one of the scariest, especially in Winter due to cross winds around the rock and across the Bay of Algeciras but also because you fly in quite low over the sea, and the runway is in such close proximity to the city centre. The main road goes across the runway and they close it off to cars and pedestrians when a plane arrives or departs. It's a weird feeling walking over a runway, you keep looking around expecting a plane to hurtle over your head any moment!! They have a lovely (newish) terminal building and I believe they have plans to open a tunnel of some sorts under the runway in the future so that will end the need to stop traffic every five minutes. The flight is just under 3 hours from Birmingham and our landing was in no way bumpy or uncomfortable, the approach and landing were exciting, and I'll say it again, I swear if I could have opened those plane windows I would have been able to touch the ocean!! If you read the previous post you'll know we headed straight for the border, picked up our hire car in La Linea and then headed further down the coast to our destination. 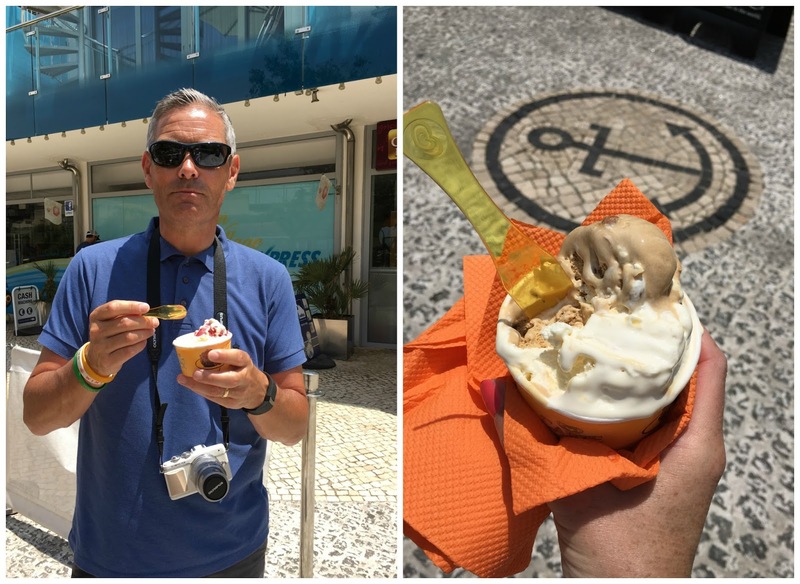 These pics were all taken on our last day when we spent the day in Gib before catching our flight back home. However, if you're staying in Gibraltar then getting into the city is easy. You can catch a bus which you'll find just as you come out of the airport or you can walk which will take you around ten minutes or so. 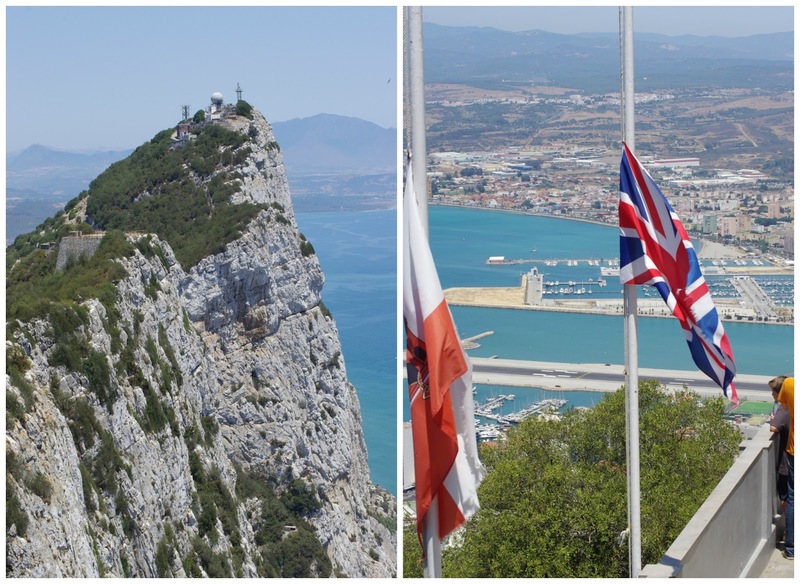 Gibraltar is a British Territory located in the Southern end of the Iberian peninsula with its main attraction being the 426 metre high rock made of Jurassic limestone. Shopping also draws in millions of visitors each year because it is a VAT free jurisdiction so offers great value, the currency is the Gibraltar pound, equivalent to Sterling so there's also the bonus of no costly currency conversions for visitors form the UK! I got my first Jo Malone fragrance here and it was quite a bit cheaper. It really is like being in the UK, with all the usual red phone boxes, British police and the usual pubs and shops that we all know. The official language is English but most locals are bilingual. 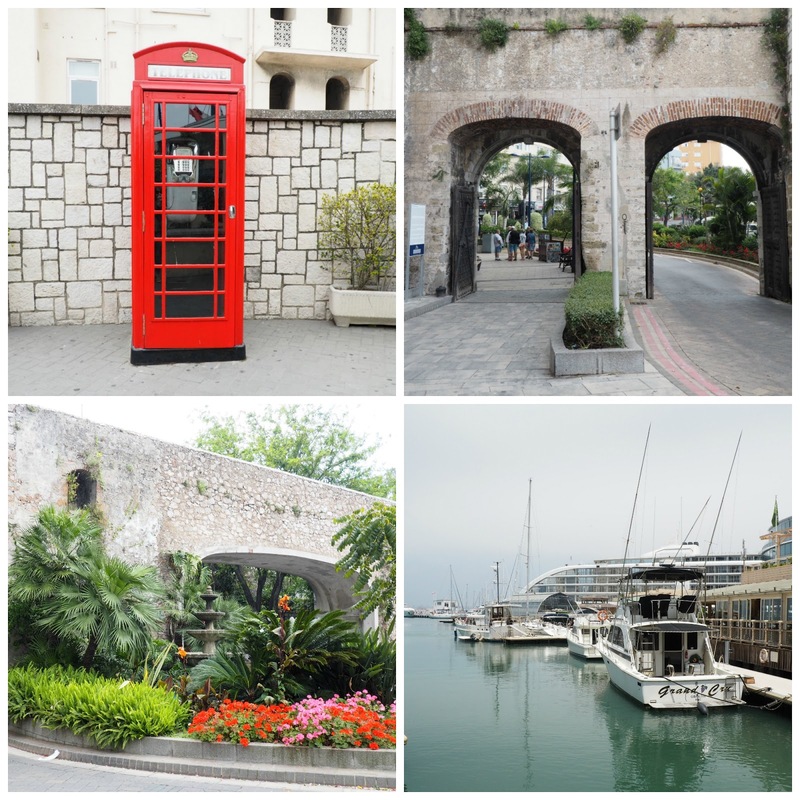 Entering through the city gates you'll find yourself in Casemates Square full of cafes and restaurants and the main shopping street stretches out ahead of that. The only thing I don't like about Gibraltar is the dodgy weather, sorry but it is, as its so changeable. So many times we've been and it's just like the weather in the UK, I can count on one hand the amount of times it was sunny. There's often this type of eery mist that hangs over the rock and that's exactly what happened on the day we went. So to compensate I thought I'd pop in a few photos from a previous trip up the rock. And it was on a rare sunny day, yay! If you don't like heights there's no way you'll take the cable car up, it's very high, but you don't have to miss out, as I said there are plenty of car tours to take you up the rock giving you all the history on the way. The views when you get there are truly spectacular, and on a good day you can see Morocco. The barbary macaques are another draw. They're everywhere. They'll be there to greet you as soon as you step off the cable car but don't be alarmed by them. They're semi wild but they are very brave and some naughty ones have been known to steal handbags and will attempt to take any food you have if you get too close. Take note of my Walkers crips photo below!!!! 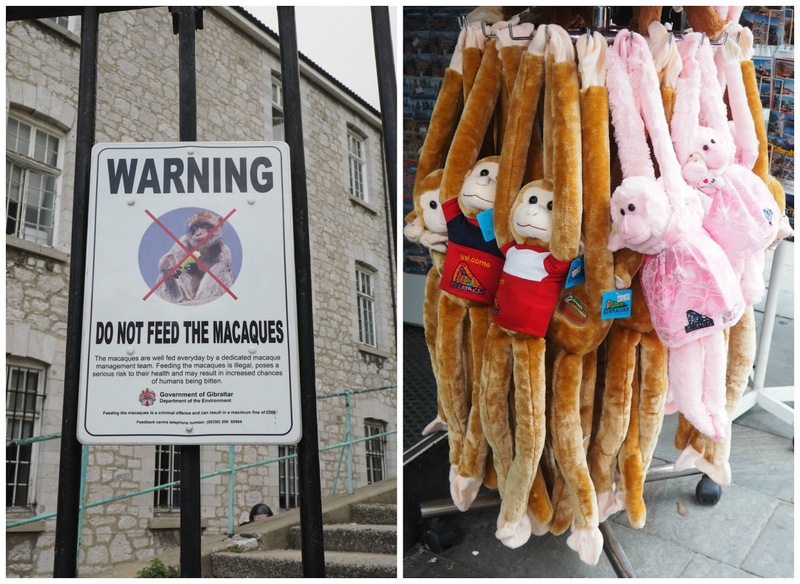 They say (whoever they are) that for as long as the apes are on the rock Gibraltar will remain under British rule. Some cheeky ones even venture off the rock and into the town. Keep your eye out. Mr C and I still have so much of the rock to explore, we've only done the top, yet there are so many roads and tunnels, so much rich history. I think some of the tunnels are still in use now by the military but closed to the public. Another area we visited for the first time was Ocean Village. An area full of upper class accommodation set around the marina with an abundance of restaurants and shops too. It's a lovely area and as we got there the sun came out. The Sunborn, an ex cruise liner is moored here permanently and is now a 5 star hotel and casino. Gibraltar plays host to numerous cruise ships coming in and out with The Straits being one of the busiest shipping lanes in the world. Ocean Village is really lovely but sadly we didn't have much of our day left to spend here so I need to come back to carry on where we left off. 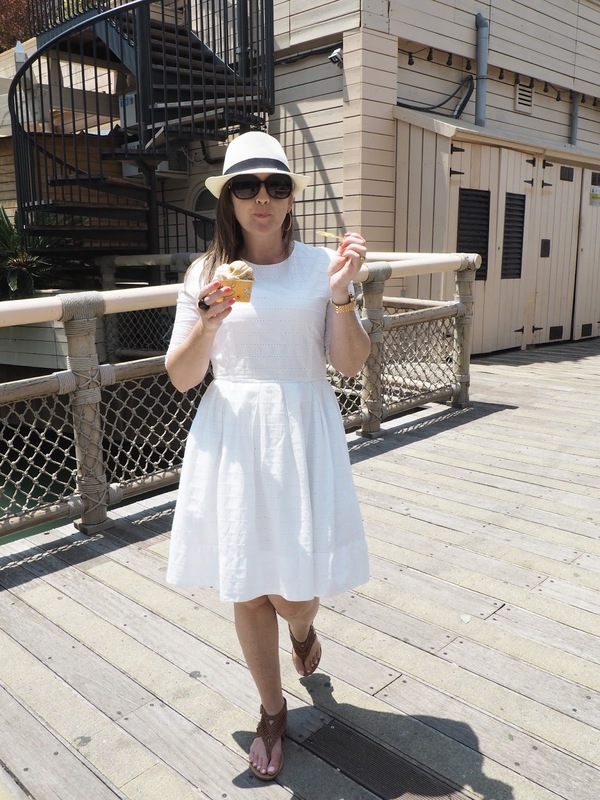 Managed to squeeze in an ice cream though. There are two main hotels that I know of, The Rock Hotel and The Caleta Hotel. If you want style (and the expense) there's the Sunborn liner. There are other hotels and you can find more info on the Visit Gibraltar website. If you're staying on the Costa Del Sol I would highly recommend a visit to Gibraltar. You can book a coach trip or if you have you own car you can drive there, it's take about 45 minutes from Calahonda (not far from Marbella) on the toll roads. If taking your car you have two options, either park outside in La Linea OR drive in. A word of warning though if you decide to drive in there could be a very, very long line of traffic going in and it's slow moving as most are workers and everyone needs to clear customs. We prefer to park outside and walk in. Most times we've been lucky enough to find metered on street parking but if not there are a few car parks you can use. If your'e staying in Gibraltar and fancy visiting Spain, it's easy. You'll go through customs and find yourself in La Linea which has bars and restaurants literally over the road but its not the prettiest of places, a little rough around the edges if you will. I'd suggest hiring a car, if only for the day and drive down the coast to Estepona or Marbella. If going into Gibraltar or going into Spain for the day DO NOT forget your passport- you'll be going nowhere without it!!! 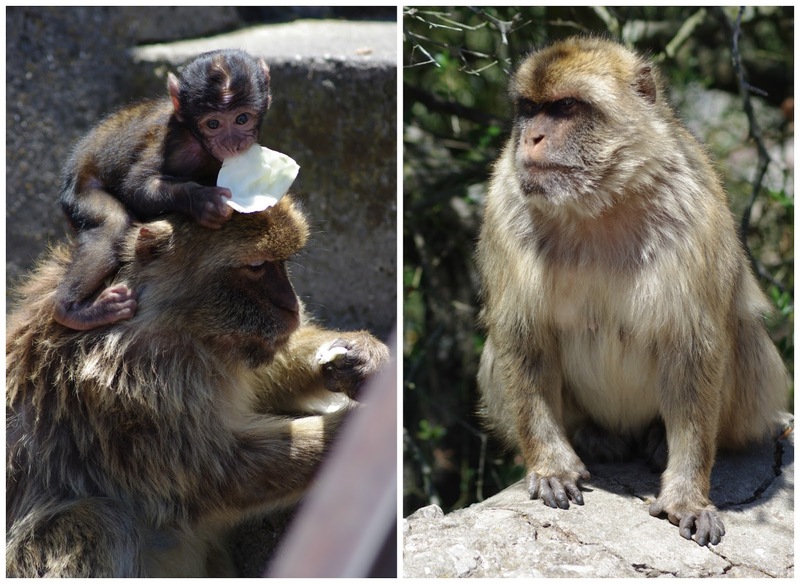 I hope this post has shown you just why Gibraltar is great for a short break away. 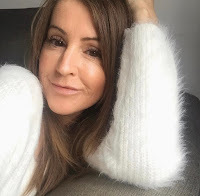 You get off the plane and you're more or less there, the centre is ten minutes away, it's British (no need to change currency) they have fabulous shopping and there's lots of exploring to do, oh and you can hop over to Spain if the fancy takes you. If you want more on the history, what more there is do and hotel info you'll find all you need to know here. Did you like this post? I'd love to know what you think before I start prepping the next one in the series. Nice wee post on Gib, I lived therr for a few years and while you have been unfortunate with the weather I had many long sunny days which enhances the rock. I agree great approach into Gib, normally by sitting on right hand side of the aircraft flying around the rock, this is with the prevailing winds the more common approach into Gib rather than from "the other end" of the runway...as you say great opportunity to explore the coast line up to Malaga from Gib, and beyond if mite time allows, and also.possible to visit Sevilla and more going in the opposite direction. Thanks for that Alan, and like you say some wonderful areas to also explore up the coast. Spain is not somewhere I know a lot about at all.. So look forward to reading the rest of your series. 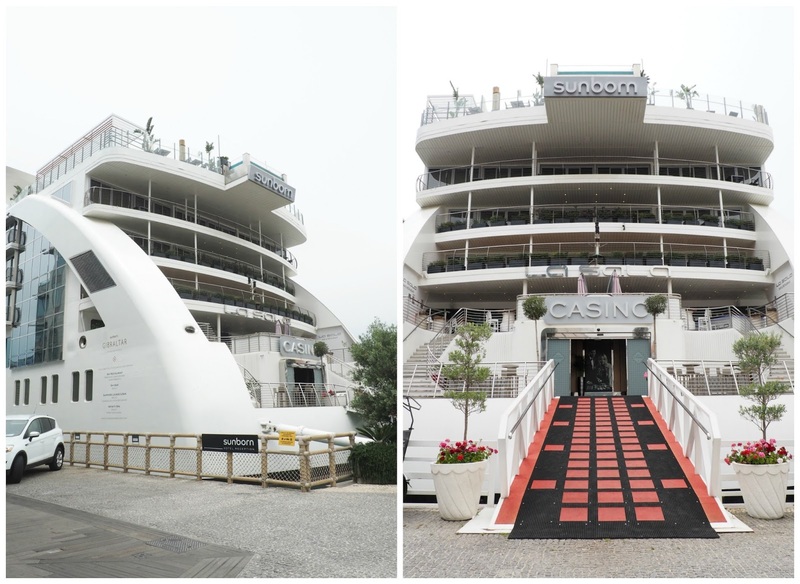 Ocean Village looks fab.. That liner/casino looks amazing!!! Aww thanks Caroline. Next instalment coming shortly. Great post hun! I'd love to visit Gib and I know Marks keen on taking me there!